Existing food systems remain critical in supporting the livelihoods of impoverished households; however, the current agricultural model and accepted food chain continue to place stress on environmental resources such as soil and biodiversity. Across the African continent, hunger and food insecurity remain major developmental challenges and African countries have registered mixed results in related goals as per the erstwhile Millennium Development Goals (MDGs). The post-2015 agenda, and in particular the Sustainable Development Goals (SDGs), calls for renewed efforts at enhancing food systems – in essence, an overhaul of food systems is necessary to ensure that they become “more productive, environmentally sustainable and resilient while preserving and enhancing (these) livelihood benefits” (IIED, 2013). Sustainable food systems are critical to the survival of households and communities, as well as the preservation of precious environmental resources, and is aligned with realizing the SDGs. 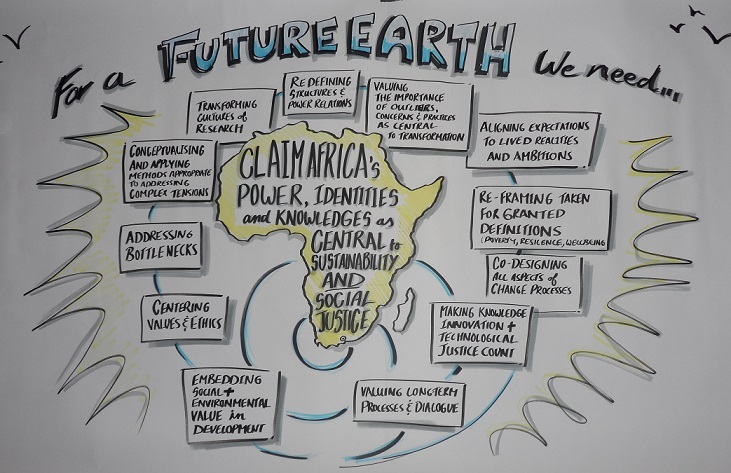 This reasoning informed a special session on Transforming African Food Systems at the Seedbeds of Transformation Conference from 9-11 May, held in Port Elizabeth (South Africa). 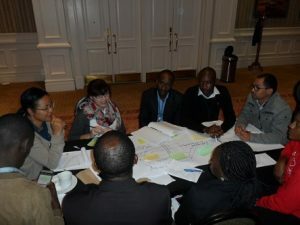 The session, co-chaired by Laura Pereira from the Centre for Food Policy (City University of London) and Felix Kwabena Donkor of the School of Animal Plant and Environmental Sciences (University of the Witwatersrand), gathered approximately 100 people from diverse nationalities and disciplines to cross pollinate ideas on this urgent theme. The session adopted the Three Horizons (3H) framework and merged it with a panel discussion to convene a mini-transformative space reflecting on how a focus on transforming African food systems can help meet the integrated set of SDGs. 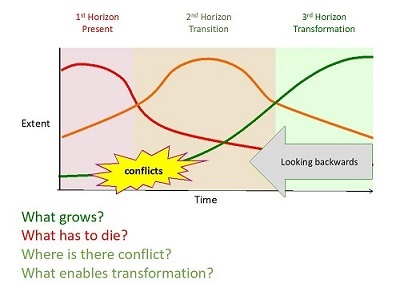 The Three Horizons framework is a graphical approach used to forecast the scenarios of change in issues across time scales, and link the future to the present (Curry 2015). As a supplement to scenarios process, this method facilitates the probing of requisite transition space and pathways that engender the systemic changes projected in future scenarios (Figure 1). Starting with Horizon 3- Participants envisioned how positive future food systems look like and their underlying ethics/relationships/principles. • Emerging farmers gain fair/equitable market access. Horizon 1 – Here participants gave their opinions on what the current system looks like and what is dominant. Low education about agriculture and low interest in it as a career, especially amongst the youth. Enokenwa Ojong (Rhodes University), alluding to her work on stratified gender household types and Pygmy communities from Cameroon, suggested that the multiple gender dynamics within households and systems produces some level of inequalities that are often overlooked and can also contribute towards creating food insecurity. Such nuances should be informed through research and addressed in line with the Three Horizons framework whilst ensuring that at each stage the inter-sectionalities within a system are carefully considered. Christopher Mabeza (Open University of Zimbabwe) referenced his work undertaken in rural Zimbabwe and opined the need for indigenous knowledge systems to be harnessed in alleviating the challenge of widespread food insecurity and enhancing household wellbeing. Regarding food waste, Abubaker Hadisu from (University of the Witwatersrand) argued for combining behavioural change and technology in solving the problem of food wastage using case studies from Nigeria. The Seedbeds of Transformation: The Role of Science with Society and the Sustainable Development Goals (SDGs) in Africa” was hosted by Future Earth, the South African Government Department of Science and Technology, the National Research Foundation of South Africa, and START. This entry was tagged africa, agriculture, food, Food policy, food system, livelihoods, MDGs, SDGs, seedbeds, sustainable, Three Horizons Framework, transformation. Bookmark the permalink.